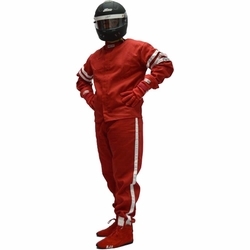 Race Suit ELITE SFI-15 or SFI-20 ShownWhen your driving suit order will ship depends on whether you order in stock standard firesuits or a custom fire suit. At this time, In stock STANDARD racing suits are now shipping within: Same Day - 2 business days when ordered by noon EST. We strongly recommend placing your race orders early BEFORE THE RACING SEASON RUSH! To our racecar driving friends, we strongly recommend that you place your racing suit orders early, before the start of the auto racing season rush, to avoid delays of delivery of your race suit. Make sure you have your racing suits in time for the racing season! Our Racing suits are fire resistant, constructed with all fire retardant materials made of Arimand and Kevlar blend; Nomex 3 fabric sewn with high quality Nomex thread, Nomex cuffs and Nomex zippers. SFI 3-2-A/5 race suits and up are quilted together to make one of our finest fire resistant race suits. All suits have flex back jackets for better auto racing comfort. Standard style is a solid color suit with 3-1" ribbon trim on upper part of each arm and 1-1" ribbon trim down each leg (except our Racer-5 suit and Elite suit - no stripes). White ribbon and white cuffs are standard. Choose from our Nomex suits, Proban suits, Racer-5, Jr. Dragster, Quarter Midget suits or our Custom driving suits found below. You're going to love our fire resistant suits! CUSTOM race suits / firesuits ship time. Design your own! 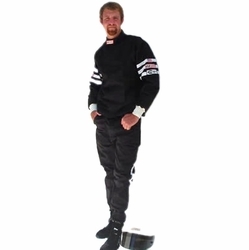 Get a custom driving suit made in the U.S. for the price of our competitors off the shelf driving suit! We have 8 custom racing suit styles to choose from. FR Cotton material fire resistant racing suits. Many colors to choose from! SFI-1 (SFI 3-2A/1) fire rated race suits one or 2-piece. These RJS driving suits meet and exceed SFI 3-2A/5 standards and requirements WITHOUT the expense of a Nomex SFI-5 suit! 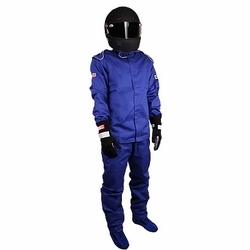 SFI 3-2A/1 thru 3-2A/20 ( SFI-1 SFI-5 SFI-15 and SFI-20 ) fire resistant Racing Suit. Multi and single layer Nomex racing suits. Choose the perfect racing suit for you with many colors and sizes to choose from! 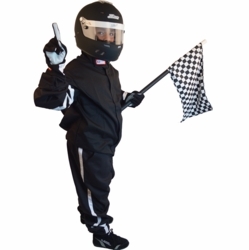 Quarter midget racing suits and junior dragster race suits are fire resistant and safety SFI rated racing gear. Choose the perfect race suit for you with many colors and sizes to choose from. Our racing accessories & race gear equipment should not be missed!